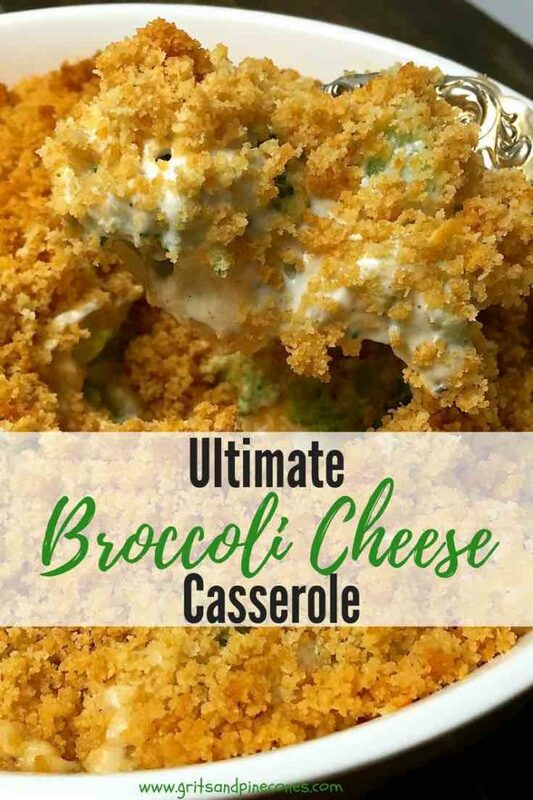 When you see a recipe with the name Ultimate Broccoli Cheese Casserole you expect it to be, pretty spectacular. 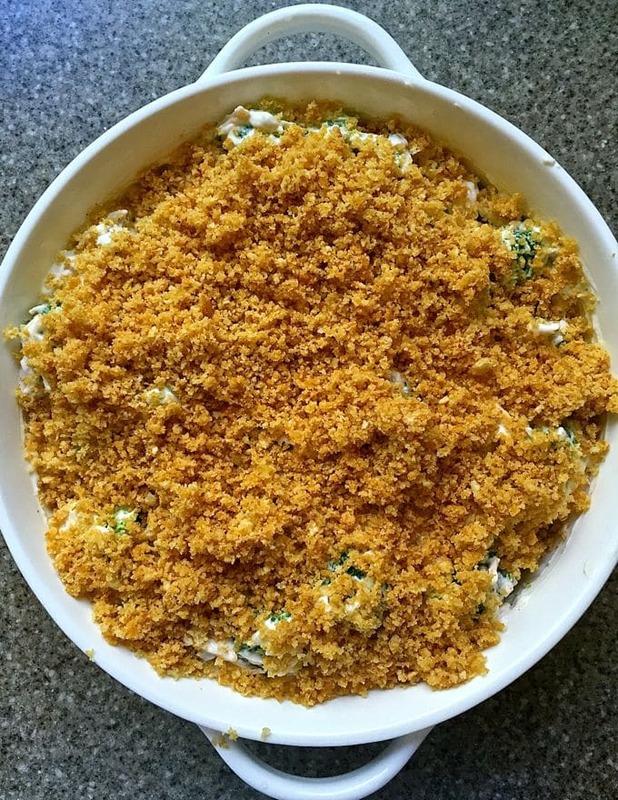 This delicious recipe for broccoli casserole with Ritz crackers loaded with cheesy goodness lives up to its name! Just imagine, healthy crisp broccoli covered with a smooth and creamy sauce made with tangy sour cream. Add cream of mushroom soup, mayonnaise, and sharp cheddar cheese. Top with a crunchy crushed Ritz cracker crust. 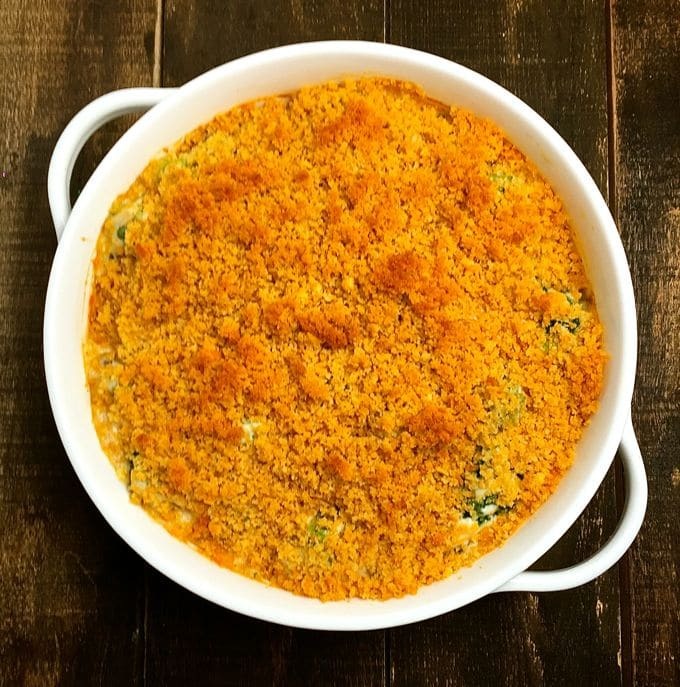 This broccoli and cheese casserole really is the ultimate side dish! This iconic broccoli and cheese casserole recipe pairs well with just about any entrée. It is also the perfect side dish for holiday dinners, potlucks or really any meal where you want to impress your family or guests! Guess what? This crowd-pleasing broccoli recipe only takes about 5 minutes to mix everything together. And yes, you can make it a day or so ahead of time, so all you have to do is pop it in the oven on the big day. Broccoli is my favorite vegetable and if you like broccoli as I do, check out these other popular broccoli recipes on my blog: Broccoli Cauliflower Salad with Cranberries, Broccoli Cheddar Cornbread Muffins, Easy Mushroom and Broccoli Frittata, Potato Broccoli Salad with Vinaigrette, and Easy Chicken and Broccoli Stir Fry. Looking for more Thanksgiving dinner menu ideas, check out these delicious recipes: Creamy Make-Ahead Mashed Potatoes, Green Bean Bundles Wrapped in Bacon, Traditional Southern Cornbread Dressing, Spicy Southern Corn Casserole, Southern Sweet Onion Casserole, Simple and Perfect Roast Turkey and 31 Best Thanksgiving Desserts. Looking for more Easter menu ideas? Check out my posts 45 Dazzling and Delicious Easter Desserts,38 Easy Easter Dinner Menu Ideas and Recipes, and Easter Dinner Side Dish Menu Ideas and Recipes! 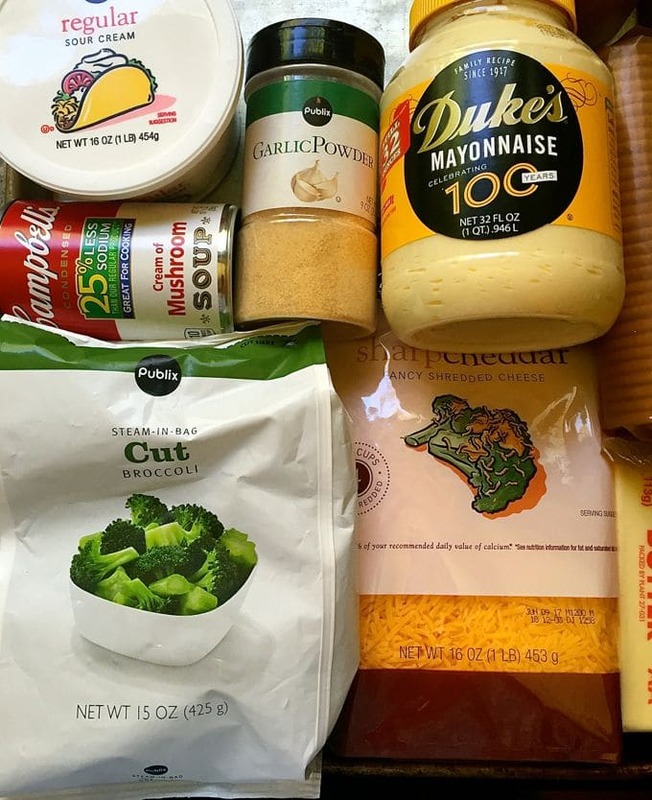 You will need fresh or frozen broccoli, sour cream, mayonnaise, cream of mushroom soup, sharp cheddar cheese, garlic powder, Kosher salt, ground black pepper, Ritz crackers, and unsalted butter. When you are ready to get started, gather your ingredients and preheat the oven to 350 degrees. 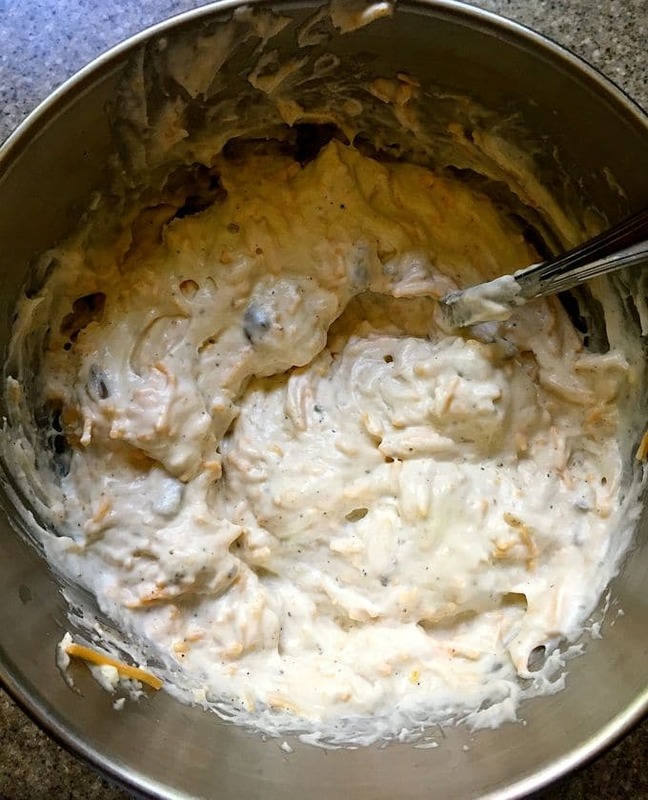 Combine the sour cream, mayonnaise, cream of mushroom soup, garlic powder, salt, pepper, and grated cheese in a large bowl. Mix well and add the broccoli! Place the Ritz crackers in a food processor fitted with a steel blade and process. Add the melted butter and pulse a few times to combine. Or, manually crush the Ritz crackers and mix with the melted butter. Liberally spray a 2-quart baking dish with a non-stick cooking spray and add the broccoli mixture and spread out. Top evenly with the cracker crumbs. Bake the casserole uncovered for 30-35 minutes or until it is bubbly and the cracker crust is lightly browned. 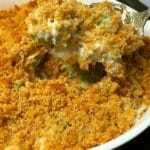 Let sit for about 5 minutes and serve this delicious broccoli casserole with Ritz cracker crust. If you are making this broccoli and cheese casserole ahead, assemble the casserole, cover and refrigerate up to 24 hours. Then bake as directed. You may need to add an additional 10-15 minutes to the total baking time. If you don’t have any Ritz crackers, crush croutons and use them instead. You can also substitute panko bread crumbs. 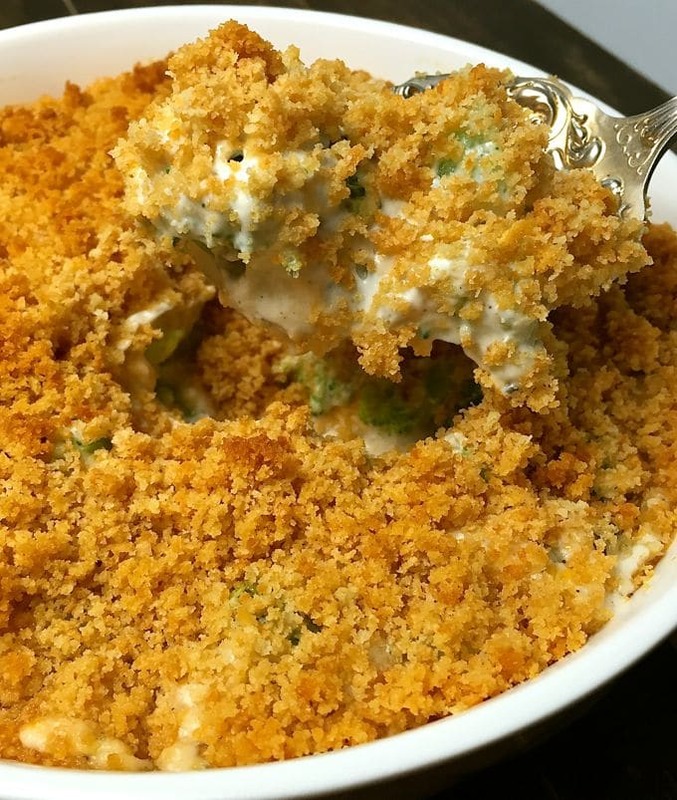 Ultimate Broccoli Cheese Casserole pairs well with just about any entrée and this delicious, iconic Southern dish is the perfect side for your Easter dinner. 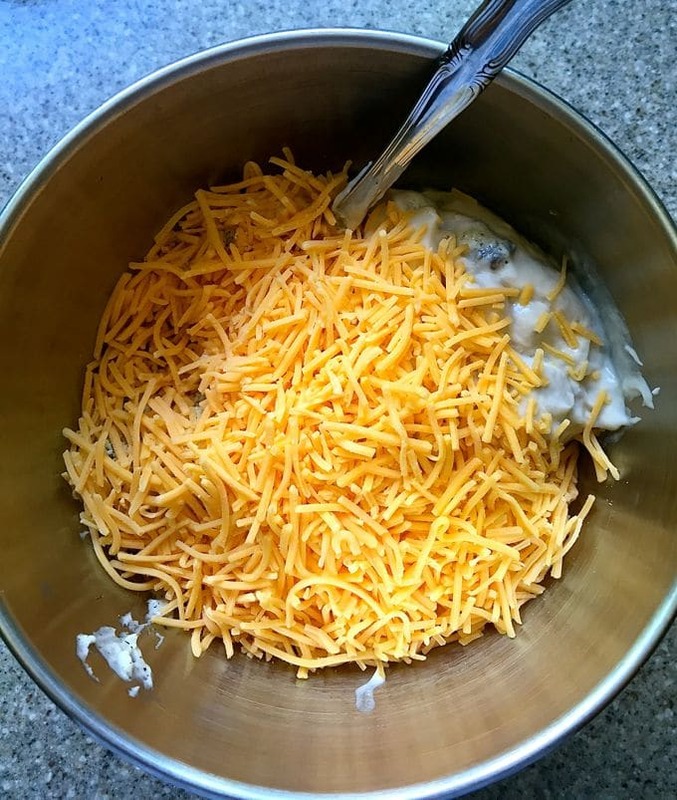 Combine the sour cream, mayonnaise, cream of mushroom soup, garlic powder, salt, pepper, and grated cheese in a large bowl. Add the broccoli and mix well. Bake the casserole uncovered for 30-35 minutes or until it is bubbly and the cracker crust is lightly browned. Let sit for about 5 minutes and serve. If you don't have any Ritz crackers, you can substitute crushed croutons. You can also substitute panko bread crumbs. Thank you for this recipe and also the ability to adjust the servings!!! You are very welcome. I hope you enjoy it! if you are using fresh broccoli do you have to steam before? Hi Candace, I usually don’t cook it before hand because I like my broccoli crisp. It’s going to cook for about 35 minutes in the oven. But if your family likes it soft, by all means, steam or microwave it for a few minutes. I hope you enjoy it! I made this yesterday for Easter & it was a hit! Everybody liked the crisp broccoli (I used fresh) but, next time I will either steam a little before hand or, bake a little longer than the 35 minutes. Otherwise, the taste was great! Hi Shannon, I’m so glad you and your family enjoyed it. I actually served it for Easter too and it’s one of my family’s favorites. I had another lady ask about steaming or blanching the fresh broccoli first and I’ve never done it, but by all means, if you like your broccoli a little softer I would definitely try that next time! Thanks for sharing. will definitely let you know how it did ! Broccoli Cheese Casserole has been on my Thanksgiving table for as long as I can remember… I hope your family loves it too! I’m just wondering…if I use the frozen broccoli (which I plan to)….and make it ahead (it says can do 24 hours ahead and keep in fridge)….won’t the broccoli start to thaw and cause a watery effect? I might even do the morning of but either way it’ll still be in frig a minimum of 6 hours and max of 24 and I’m worried about the dish becoming watery. Thank you for any insight! I’ve made it before with frozen broccoli and let it sit overnight in the fridge, and while I wasn’t looking for it specifically I never noticed that it was watery. I don’t think it should be a problem. If I wanted to add rice to this recipe how would you recommend I do that? I have never added rice, but I think it would work best if you cooked the rice first and then added it to the broccoli mixture before you bake it. I would guess that about two cups of cooked rice would be about right. Looks good will try this for thanksgiving. Hi Karen, It’s definitely a favorite in our family and I can’t remember a Thanksgiving or Easter when it wasn’t on our table. I hope you and your family enjoy it! Any ideas on how I could adjust this for the crock-pot? I want to make it for a Thanksgiving potluck super:) Thanks! I’m so sorry but I have never cooked it in the crockpot so I really don’t know how it would turn out. I’m worried that the broccoli might get too soft and the topping won’t be crispy. You could make the casserole the night before and then just cook it right before you leave for the pot-luck super if that helps. Making for Thanksgiving , think it will be a great! I hope your family and/or guests enjoy it. It’s been on our Thanksgiving and Christmas table every year for as long as I can remember! Tried your recipe today. Was easy to put together and everyone liked it. Just added about 1/2 cup chopped onion to it. Thank you for another broccoli casserole that I can take to a special occasion. Thanks so much for sharing David! I think adding the onion was a great touch! Hi Jessica, I think Cream of Celery Soup would be a great substitute for the Cream of Mushroom soup! I hope you enjoy the casserole! Do you think you can substitute the cream of mushroom with cream of chicken soup? Hi Mel, yes, Cream of Chicken should work fine. The casserole will have a slightly different flavor, but should still be good. I’m literally about to make this right now! This will be the first time I did Christmas dinner for my family by myself. I am really the only broccoli casserole fan but everyone is willing to try it. Wish me luck! I so hope you and your family enjoyed the broccoli casserole! I have been making broccoli casserole for years. I use crushed potato chips on the top. No need to add butter, there is enough oil in the chips. Hi, can this be frozen and used at a later date? Hi Bonnie! Absolutely! Do everything up to the step to bake it and wrap it tightly in saran wrap and tin foil. Be sure to let it thaw overnight in the fridge the day you plan to bake it. Can you use a substitute for the mayo? Like maybe adding more sour cream or using yogurt? Hi Shawna, you can definitely add more sour cream instead of the mayo. I’ve never tried yogurt. I hope you enjoy it!